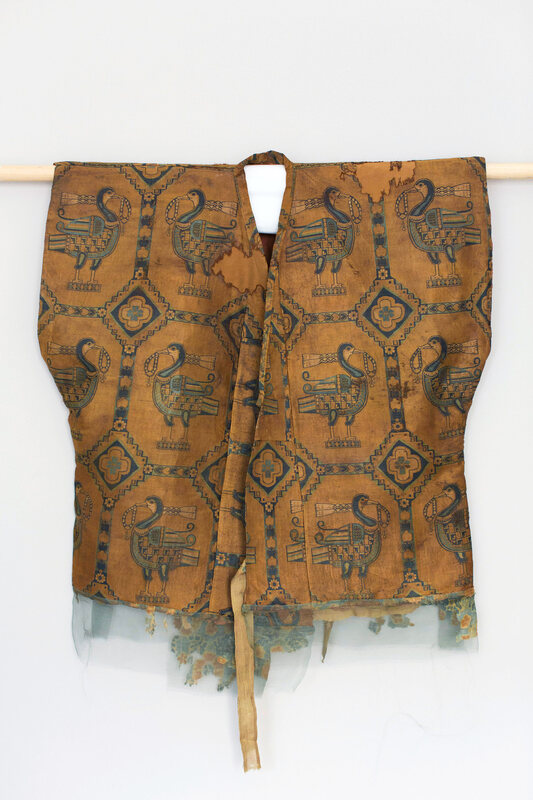 The pride of a member of the lost Sogdian Empire, this gorgeous samite shirt is decorated with "ducks wearing scarves and holding pearl necklaces in their beaks, encased in octagon motifs featuring hearts." Despite being from the 7th-9th century, it's still in excellent shape today. The auction takes place April 25th, and the shirt is expected to fetch 300,000-500,000 pounds. Nytimes article, Guardian article. Yes, but is it pure and shimmering? But is it navy or black? I'm definitely going to need a reproduction of this using modern materials, thanks. How did they manage to store up for themselves such a treasured shirt on earth, where moths and vermin destroy? Were the Samites know as "those who conquer in bitchin' PJs?" Because they should have been. i mean. it could also be that scarf duck was the foremost meme of the day. Someday, when our own empire has likewise been consigned to the ash-heaps of history, whomever comes after will similarly be made rapt by an inexplicably surviving tacky Christmas sweater. Don't miss the linked New York Times article and its graphic pointing out many details of the shirt. 300,000 to 500,000 pounds of what? I hope it's pudding. Yeah, I would really love a shirt with that pattern. filthy light thief: post your results when you're done with it! I can imagine a t-shirt with this design will be available to the world shortly after you upload it, and someone enterprising will do an actual reproduction (via something like: Spoonflower.com) quicker than I'd imagine. The New York Times said "millenniums". Does it make me old that it was like nails on a blackboard? I mean surely some people just really don't belong on my lawn, or on the lawn of any reasonable person, right? Also, though they haven't correct "milleniums" there this erratum "An earlier version of this article misspelled the surname of the head of auction sales for the Middle East department of Sotheby’s. He is Benedict Carter, not Roy." which implies they somehow misspelled "Carter" as "Roy." The shirt looks very nice and in amazing condition given it's age. For that kind of price, I expect to be able to return it if it doesn't fit. Sartor.cz has wonderful stuff, and they make custom brocade. omg Sartor is a dangerous place and I don't even sew! How, I wonder, did the unnamed "French owner" come to possess such an object? > The New York Times said "millenniums". Does it make me old that it was like nails on a blackboard? > Also, though they haven't correct "milleniums"
There is nothing to correct; "milleniums" is a perfectly good plural. Check any dictionary. There is not One Right Way to say things. And remember, friends don't let friends become peevers. It’s always so cool to see historical artifacts like this, because it makes me realize how wrong my mental images of the past are. I mean, I know this wasnt a Jane Commoner shirt but still — I always imagine everyone except Chinese and Elizabethan royalty in earth toned linen or wool. It’s sort of similar to when you find out that all those elegant white marble statues and muted colonial interiors were actually painted bright, garish colors back in the day. OH MY GOD THAT DUCK JUST STOLE MY PEARLS!! I'd do a vector pattern for Spoonflower if someone sews it for me. You see how neat those seams are? It's amazing. On the one hand, I'm devastated to have been scolded by languagehat, my language hero, even if he is standing on my lawn on this particular occasion. On the other hand, languagehat is even more my hero now because even while quoting my mistake he somehow restrained the urge to point out that I made a mistake in my correction sentence. Seriously I do think the shirt is super interesting, despite the fact that I've so far primarily commented on my peeve. > "milleniums" is a perfectly good plural. EXCUSE ME BUT I BELIEVE THE PHRASE AT ISSUE IS: "...it is proof of the way clothes have been used to express power and aspiration for millenniums," AND THAT THE CORRECT WORD IS "millennials". > On the one hand, I'm devastated to have been scolded by languagehat, my language hero, even if he is standing on my lawn on this particular occasion. On the other hand, languagehat is even more my hero now because even while quoting my mistake he somehow restrained the urge to point out that I made a mistake in my correction sentence. Oh my, the pattern on that Sogdian Silk with Winged Horses material from Sartor! At $87 per meter, the new duvet cover I want to make would cost $?..... !! Welp, I guess it's a good thing all that print is sold out. Do any of the links say where the shirt has been and how it was kept so pristine? I’d love to hear that history. So how has this shirt been preserved for so long? What is it's history and provenance? How the hell does a shirt survive for 1000 years?! A shirt like that, you don't wear all at once. "Hey! (Bum bum bum) Got any pearls?" Which raises the question of whether a bill is a type of beak or whether they are two separate categories of avian mouths. So cool. That shirt was worn by some super important Sogdian dude, where my wife is from and I could well have been standing right where they stood. But it was 1000 years ago, and they were all Zoroastrians. In the "second best land" as specifically called out in the Avesta. Just blows my mind, man. Great post! And that link to sartor.cz is magnificent too. I have inherited some more than 1000 year-old pieces of coptic textile, and though they are small and shabby compared to this, every time I pass them in the hallway I think of how weird it is that something so fragile has existed for so long. I too am in love with this pattern, and if we are grouping up to kickstart having fabric made, keep me posted, as I'm in. el io: filthy light thief: post your results when you're done with it! It's going to take some work, as the photos of the garment don't have any straight-on images of the pattern, but I'm going to make it happen. I'll likely straighten it as best as I can, then re-draw it, possibly as a vector drawing. TBD.